The Perfect Mate series is about four sister who are shifters with a special generational gift. This gift is released when they turn 18 when they normally start feeling a yearning to mate. Once one of the sisters meet their mate and they have their first physical encounter, if it is the sister’s perfect mate, then the sister will gain a second unique gift. Their mate will also have the receive the same gift. However, if they mate with the wrong man then that man will take their gift and will be able to control the sister for life. Destiny’s Mate by Brey King is the first of four novellas in the Perfect Mate series. This series is a paranormal romance series that centers around four werewolf sisters with each book featuring a sister finding their mate. Destiny is the first of the four sisters that is determined she’s not going into the arranged mating her parents want and instead has run away to find the man she knows is her perfect mate. After a couple of years on the run and in hiding Destiny is about to meet her man when out of nowhere an accident happens that puts their new found relationship in danger. 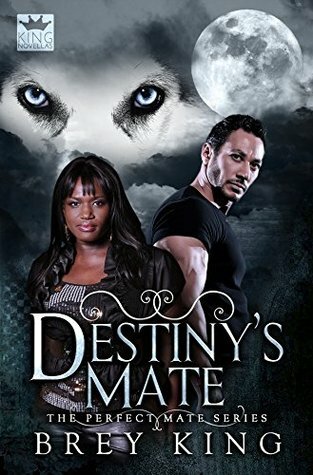 Going into Destiny’s Mate I knew that this was a novella so I expected the story to be really short but what I didn’t expect was feeling like I’d read a rough draft or outline of a book. I am a huge fan of a fast pace read but this one was over within the blink of an eye and felt like it barely touched the surface of the events in the book. It’s really a shame too that the author chose not to go deeper with this story because there were hints at some things that would make it stand out in this particular genre. I’d also like to note that for me as short as this one was it felt a tad repetitive with the use of “my mate” over and over thus another thing that brought it down a bit in my opinion. I get the whole shifter dynamic so it didn’t need to be said every other paragraph. So unfortunately this one just wasn’t my cup of tea having read much more detailed stories at the same length. I received an a copy from the publisher via NetGalley. I think I’ve mentioned I’m not overly fond of novellas but this sounds especially underdeveloped. I’m definitely not tempted here. Great review Carrie. Thanks, hated being so negative but it really did feel more like a jotted down rough draft or something. Bummer with the book! I’m not a huge fan of novellas. I feel like character development and plot depth also suffer. When they work they’re great but quite often it does leave that longing for more feeling.